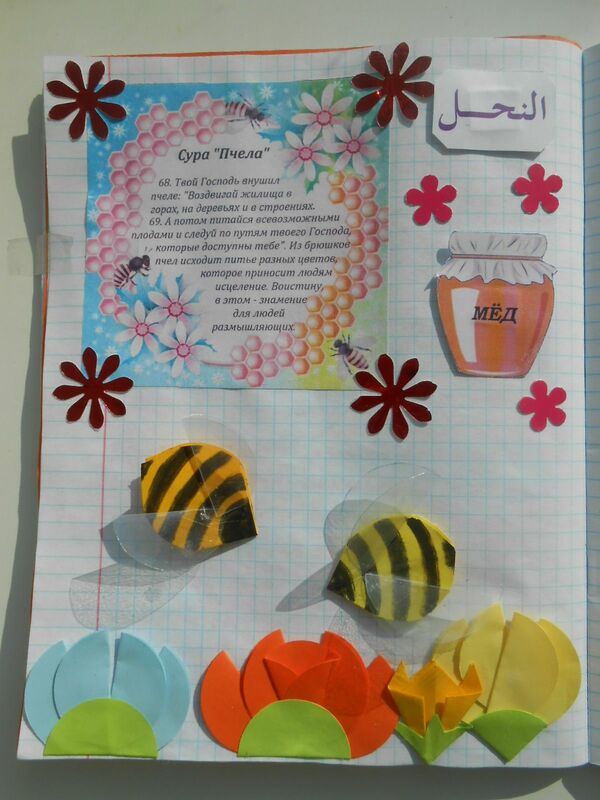 surah an-naHl, “The Bees,” struck a different chord with me at first. If I had to pin down the source of this, I would say that’s because a sizable portion of it targets the good believers. The majority of our past suwar have been densely saturated with rebukes and condemnations for Muhammad to pass along to unbelievers, hypocrites, or even believers who have failed to show good character. This surah talks at length to a body of believers who are not in a bad way spiritually but are still undergoing persecution and rejection. Large chunks of ayat smart with resentment of the unbelievers, but others focus on the good things provided by God without any mention of avenging justice. The ultimate message of this surah to believers is to be grateful to God for the good things of the creation, the good things they are called to practice in lieu of idolatry, and (yes) the justice that awaits the unbelievers. Many of the 128 ayat are sweet enough to be worthy of cross-stitching onto pillows and crafting into children’s projects. The sections that left the biggest impression on me were, yet again, those examining nature to see God. These kinds of passages have caught my attention several times prior, namely in The Cattle and The Thunder, largely because they are so optimistic and wonder-filled. The natural wonders mentioned in this surah tend to be human-centric, as if to prove the existence of God by showing how the world benefits men so much that it must have been designed for them. The creation of the heavens and earth starts off our images to set up God’s power and dominion, and then the next prioritized creation to mention is mankind. Right away ayah 4 includes the irony that humans respond to God as adversaries, an irony that is emphasized as the camera pans to the rest of creation. The surah teaches men that everything that contributes to their survival –from the tame animals, scenery, honeybees, leather, human faculties and intelligence– is a gift from God and needs to be observed as such. Going further than providing means for survival, the surah calls people to see how God has further provided for their aesthetic and physical pleasure. (Curiously, wine is nestled in these lists of God given gifts.) The passages are man-centric perhaps not because the Quran intends men to think that they are the center of God’s existence, but because its goal is to show them their obligation to be grateful. Not all passages talk about God acting for the good of men though. Ayah 70 takes an abrupt change in direction by also notifying men that God is also responsible for death, age, and senility. This ayah perhaps belongs less to the preceding ayat about God’s blessing than it does to the following ayat about God’s unequal distribution of blessings, but it does come as an abrupt change of direction to have God suddenly presented as this source of suffering. One could take from this that the ayah is telling men to be humble. Death, age, and senility all highlight human mortality, showing how utterly unlike God they are. It also highlights that all the good things listed in the surah are things of this mortal existence, and that every human’s time with those good things will come to an end. This is counterbalanced by passages in which products that humans have to make themselves (like clothes, leather, tents) are also directly accredited to God. Thus the processes of the world, including human effort and suffering, are all part of God’s authorship and so He can be directly credited with everything. The other reason that the wonders of the world are described with their human-centric purpose in mind is because the surah wants to impress upon us how God blends utility with beauty. Horses and livestock, for example, are described for their function and aesthetic appeal. The need to describe everything in terms of function does get a little strained in the ayah about mountains. 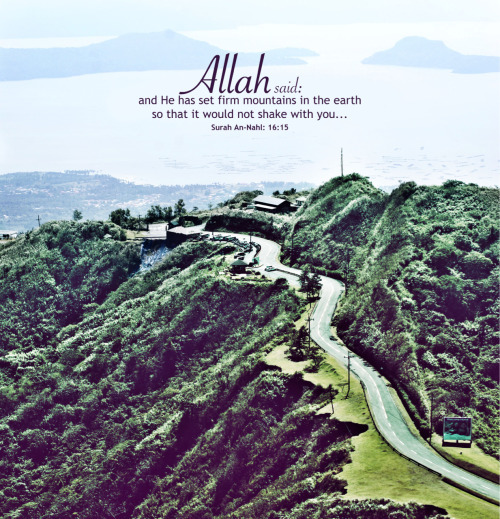 This ayah caught my attention because it is hard to harmonize that statement with plate tectonics, wherein mountains are a sign of shifting earth and not signs of stability. That which causes mountains frequently causes volcanoes and earthquakes too. A lack of mountains on your horizon is more likely to indicate stable earth. A world without shifting earth would be a world without mountains. We skeptics can concede, however, that if there was a possible model of the world in which the earth’s crust moved without creating the kind of friction that produces mountains, earthquakes, and volcanoes, then the plates would shift at an unlivable pace. Anyhow, we’re going to take the point that God has authored everything, and that His authorship is evident in the world’s mixture of utility and beauty. The reason to emphasize God’s authorship is to be sure to direct all gratitude to Him. The surah is completely dismissive and disinterested in addressing the explanations other worldviews have proposed for the same natural signs. It allows no room to question whether God is the author of the world. That God is, and that only God is, is the axiom that the Quran asserts and has no interest defending. The Quran is sometimes praised for triumphing the equality of mankind across social boundaries, and we have seen strong examples of this. Surah Hud had messages about believers constituting a solid family regardless of their social status, intellect, or bloodlines. Spiritual equality before God is strongly upheld in ayat like 96-97. Those ayat are not unique amongst our past readings. The message is that in spiritual measurements all believers have equal base value and potential before God. The only real inequality is between believers and unbelievers. In terms of secular/social equality the Quran is more mixed in its messages, something you can see in ayat 70-77. I’ll start with the positive: God favors some people with more material gifts than others, but ayah 71 makes sure to clarify that upon those blessed is a duty is to distribute their gifts and set up equality. The case condemned is extreme –a master refusing to provide for his slaves. It could be that the ayah is telling the master to free his slaves (or pay wages that would enable the slave to buy freedom), or at the least it teaches that the master is required to recognize the same essential humanity of his slaves by sharing possessions with them. This passage places a value for human rights within Muslim society, even if God has not provided to all people equality in social status. To reject distributing favors and recognizing human equality is tantamount to rejecting favor from God. On the other hand, that section of ayat continues into ayat 75-76. Here, slaves are portrayed as impotent property. Impaired children are portrayed as societal baggage and misfortunes to their parents. These examples are being used to clarify that God does not make all people equal in social status or ability, and that this is all part of God’s will. It’s a little shocking how willing the ayat are to declare that the impaired are burdensome or even detrimental to their community. It is true that in less privileged eras of history children with disabilities were an added difficulty to their family’s survival. The shock is that this ayah sees in them utterly no worth, in fact worse than worthless, placing them as the antithesis to the capably devout. And the culminating verse about God’s omniscience and competence communicates that these inequalities are beyond question. This does not help us understand The Problem of Suffering. Nor does this portrayal of disability age well in light of this era, where privileges of technology, security, and supportive society have enabled us to see immense beauty and constructive good in people with disabilities (I’d recommend Special Books by Special Kids to prove this point). I also want to highlight a set of passages that do not indicate inequality, but that might be taken out of context to argue such by polemicists. Ayat 57-62 describe an irony in the pagan Meccans’ beliefs: they say God has daughters, but hate daughters for themselves. God essentially says that if they, the pagans, think daughters are so great as to be attributed to Himself, then for them is the thing they wish. The passage rubs in its point by drawing out the negative emotional reaction of a pagan misogynist learning that his new child is female. Although the way the passage lingers on the man’s emotional reaction does leave a strong impression of misogyny in text, a complete reading makes clear that the misogyny presented is the pagans’, and that the Quran denounces their judgments as evil. Check your history and you’d have a hard case to make that Islam would be interested in calling daughters a curse: Muhammad’s three sons died as infants, his only living children were daughters. So it would be unrepresentative to wrap up this post without noting that it still contains rebukes for the unbelievers. I don’t want to spend much time on it because it is similar to stuff we’ve read before, but I do want to list the pagans’ objections if anything to explore their validity. The strongest argument the pagans make is how can they be considered unguided if God had not protected them from error in their past? There is implicit in the Quran the eye-roll that God is trying to guide them away from error, and that their objection is kind of silly given the presence of a prophet amongst them. The pagans do put up front in their argument that they are following a pattern established for generations prior, raising a question of “where was their prophet?” This is a valid question in all religions, one that can be difficult to address. The Quran has stated that every nation has received a prophet, but has every generation? How many generations of error are allowed to pass before God considers ignorance so established that it warrants a prophet? Are the forefathers who just practiced according to generational traditions, who had no prophet to correct them, going to Hell? Can God punish people who did not know any better? The surah doesn’t articulate a defense against this, and in fact tends to do the opposite when it emphasizes that mankind could have been united under guidance if God had willed it. Does God’s inaction make Him party to their sin? The surah gives no explanation, and their objection stands. The unbelievers have noticed verses being switched out and accuse Muhammad of making things up in ayat 98-102. To be specific, ayah 101 acknowledges that some ayat have been switched out for other ayat and that the people have noticed this. The Quran answers this criticism by asserting the divine handling of the revelations. Now, back in al-Baqarah 106 we’d come across a similar verse that I’d taken to refer to God allowing Hebrew and Christian scriptures to deteriorate in order to make way for Quranic revelation. That had seemed a likely understanding then given the verse’s neighboring criticisms of the People of the Book, their failed eras, their poorly preserved teachings, and their rejection of Muhammad. However, the language today directly means “Substitute an ayah [in] place [of] an ayah” and is in context of the reciting and revelation of the Quran. Why ayat are being switched out is not described or defended. Note that Abdul Haleem adds in ayah 102 the words “step by step” in order to facilitate an interpretation like this one which denies the idea that verses were being switched out at the expense of prior ones, but rather that Quranic stories were being reiterated in a spiral-curriculum formula. That idea does not explain the language of swapping inherent in the verse. Furthermore, that an omnipotent and atemporal God would have to edit the Mother of Books at all is a valid reason to doubt the Quran’s claims of perfection. Ayat 103-104 take this moment to switch to a similar kind of accusation: the unbelievers say Muhammad is being taught by someone else. The Quran defends Muhammad by pointing out that the person who they suspect is teaching Muhammad is a foreigner (a word in Arabic that has roots meaning “unintelligible”), while the Quran’s language is clear Arabic. On the one hand, this insult could be to indicate that the pagans believe the Quran is too good for Muhammad’s inherent capability, thus he must have learned it from someone else. That line of insult actually reinforces the Quran’s claims and could be why the Quran bothers to mention it here. On the other hand, this tafsir suggests that the pagans accused Muhammad of being taught by a slave. If that is the case, the pagans are not insulting Muhammad because they think the Quran is beyond his capability to produce, but because they are degrading the Quran as being foreign, low-class superstition. Both versions of the insult are only petty lines of attack that do not deal with the Quran’s content. Without knowing who it was who the pagans thought was teaching Muhammad and what the relationship was, we can’t really investigate if the pagans had any ground to stand on. The unbelievers discount Muhammad’s teaching as old-timey legends they’ve already heard before. This is in fact likely true. While the Jewish prophets might or might not have been widespread in Arab culture, certainly the stories of ‘Ad and Thamud were. –Roger Hoyland, Arabia and the Arabs, 224. So we know, and it makes sense, that Muhammad was teaching with materials that would already resonate with the regional culture. It wouldn’t make sense for him to call forth unheard-of characters and cite them as evidence, since that in no way engages in the Arabic culture he’s speaking from and to. What the pagans are trying to accuse Muhammad of can’t be made out in this presentation of their argument, however. If they do recognize the stories Muhammad is telling, wouldn’t that more likely confirm Muhammad’s message as being grounded in history? Or were these stories to Arabs like fairy tales that taught morals and engaged imaginations, but that no one believed in? Are Muhammad’s versions different from the folk versions? We do not know why the Meccans bring this connection up except maybe again to dismiss Muhammad’s preaching as derivative. Again it must be highlighted that, while I find validity in some of the pagans’ objections, they aren’t an innocent party to throw oneself behind. The believers are impatient for the Day of Judgement not because they want to see their mere mockers punished, but because they also are being physically persecuted and martyred by the pagans. We can find mention of this persecution in the text. Ayah 106 provides comfort to those who recanted their faith under physical torture but who still believe, assuring them that God only punishes those who recant willingly. Some of the believers are emigrating to escape the persecution (ayah 41), and the surah blesses of this course of action. I haven’t paid much attention lately to whether we have been reading Meccan or Medinian suwar. In fact, we have been in a long string of Meccan suwar since Surah al-Yunus (with the exception of Surah ar-Ra’d). An-Nahl is also labeled a Meccan surah, but it has content that made me question how it earned this classification. I intend to examine this content in my next post, for which I’ll try and research how and why Muslims make distinction between these two phases of Muhammad’s ministry. Wow, Tuppence, you are really delving in to this. I’m (“totally”) impressed. i read a nice little book on Muslim-Christian dialogue by a young woman at Georgetown U recently (Jordan Denari Dufner), since I knew I was going to be put in this inter religious group (which i don’t think is very theologically oriented, but we will see). I will try to follow you with The Study Quran. I bookmarked your blog. God bless you.